Snow removal in Chicago is serious business. While commuters depend on the city to keep roads clear so they can travel to and from work, homeowners also have the responsibility to do their share of snow removal. According to the Municipal Code of Chicago (4-4-310 and 10-8-180), property owners and occupants are responsible for keeping sidewalks clear of snow and ice. But lately, winters have been record-setting in terms of snowfall, making it difficult for city snow plow drivers as well as homeowners to keep up with the demands of snow removal. And last year, Chicago residents got an early dose of winter with the second heaviest November snowstorm since 1895. In fact, several parts of the country experienced record setting storms and snowfall during the winter of 2015-2016. And weather experts expect more of the same for the next several upcoming winters. But Chicago residents have options when it comes to preparing for the next snow season. In addition to having extra supplies on hand and keeping the cupboards and refrigerator well stocked, some Illinois residents are turning to radiant heat. A radiant heated loading ramp in operation during a snowstorm. 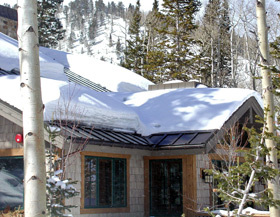 Warmzone snow melting systems are energy efficient and maintenance free. Not only do these systems eliminate the need for manual snow removal, but they have proven valuable to businesses by keeping entrances and parking areas clear of snow and ice for customers. Electric snow melting systems are fully automated, so they operate only when needed. The systems include an advanced snow sensor that detects temperature and precipitation. When temperatures are below a set point – typically 39° Fahrenheit – it sends power to the embedded heat cable, warming the area and preventing snow accumulation. As an industry leader, Warmzone snow melting systems feature trusted heat cable that is available off the spool or pre-spaced in mats that can be rolled out for easy installation. 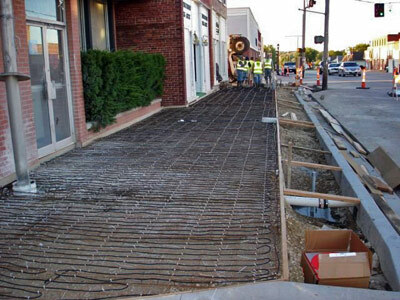 The electric radiant heating mats are laid out and secured, and then the medium (concrete, pavers, or asphalt) is applied directly over the cable. The proven ClearZone electric snowmelt system is commonly installed in both commercial and residential applications. From large heated driveways and parking areas to custom sized walkways, ramps and loading docks, ClearZone systems are versatile and can be easily customized. Warmzone’s fully automated system includes the embedded heat cable, an activation device (snow sensor), contactor panel, and marker plate (as required by the NEC). These electric systems are also maintenance free and relatively easy to install. In addition to providing the highest quality radiant heating products, Warmzone also offers unmatched customer services. Each system is professionally designed, so you’ll know the exact layout and materials, proper load calculations, breaker sizes, number of breakers, and system performance expectations before one foot of heat cable is installed. Warmzone also includes free installation support services. Our expert staff is on hand during your installation if you need. Should your installer have any questions during the installation, he/she can speak with one of our installation experts to resolve any issues. Free installation training is also available. When it comes to customer service, you’ll find that Warmzone is second to none. Contact Warmzone today and learn more about the radiant heating options that are available. In addition to offering heated driveways and snow melting systems, Warmzone also offers premier roof deicing and floor heating systems. Call 888.488.9276 to learn more. Many New York City area homeowners have turned to radiant heated floors for use as their primary home heating source or to supplement their existing home heating system. In addition to providing luxurious warmth, the energy efficiency and silent, maintenance-free operation of radiant heat has attracted homeowners throughout the tri-state area. As owners of radiant floor heating systems have attested, nothing is finer than walking on warm floors during a cold winter day. Warmzone offers a variety of electric radiant floor heating systems, as well as hydronic heated floors for homeowners and businesses alike. And because Warmzone manufactures and carries the industry’s most trusted floor heating systems, consultants can evaluate the customers’ needs and determine the best system for heating each specific floor type. Warmzone’s selection helps to ensure that customers receive the most effective floor heating system for the unique layout and type of flooring in their home. While there are some standout radiant floor heating systems, it is important to know that no single floor heating system is ideal for every type of flooring. So avoid any radiant heat provider that makes such a claim. It’s critical to speak with an unbiased radiant heating expert who can offer you a wide selection of reputable floor heating options to choose from – without bias towards one system. Don’t be talked into purchasing a floor heating system simply because it’s the only system that the provider offers. Deal with an industry leader that can show you a wide selection of radiant floor heating solutions and explain the benefits and traits of each one. Radiant heated floors are commonly installed in bathrooms and rooms where small children spend a majority of their time on the floor. Heating homes from the floor up results in greater efficiency and comfort. As such, homeowners in New York City and throughout the tri-state area are turning to radiant heat to optimize their home heating options. The most proven system for heating tile floors is the ComfortTile floor heating system. ComfortTile features thin 1/8 to 3/16-inch diameter heat cable that is available on spools or pre-spaced on flexible fiberglass mesh backing with adhesive so it can be rolled out and then secured to the subfloor for easy installation. (See the photo below.) 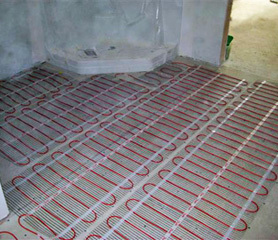 ComfortTile heat cable is also one of the most versatile floor heating systems. ComfortTile floor heating mats being installed for a heated bathroom floor. ComfortTile heat cable can also be used in conjunction with the HeatShield floor heating insulation panels. HeatShield features ½-inch thick, lightweight polystyrene insulation panels covered with thin, specially profiled aluminum to reflect all the heat upwards to the floor. 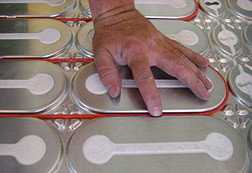 ComfortTile heating cable is inserted into the grooves of the HeatShield panels. ComfortTile heat cable shown being placed in the grooves provided of a HeatShield floor heating insulation panel. Many homes in New York feature hardwood or laminate flooring. Warmzone offers several choices for heating hardwood and laminate, but the most popular solution is the low-voltage FloorHeat STEP system. Heated hardwood floor. 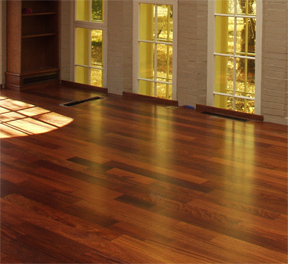 The Warmzone radiant floor heating system operates quietly and efficiently beneath the beautiful hardwood floor. The In-Slab radiant floor heating cable is designed for installation in new concrete slab applications. The heat cable is embedded at least ½-inch below the floor’s surface. In-Slab cable uses the concrete slab to efficiently store and distribute heat evenly throughout the intended area. The cable is affordable and can be installed to warm any type of flooring, including hardwood, carpet, tile, and more. Warmzone also carries RetroHeat, a thin “film” heating element that can be stapled up between floor joists to heat existing floors. The paper-thin heating element can be cut on site and is then stapled up between the floor joists and common Batt insulation is then installed over the heating panel. This directs all the heat upwards to warm the existing floor. These are just some of the choices New York residents have to heat their floors. Whether you’re looking to heat carpet, tile, marble, hardwood or any other type of floor, you won’t go wrong dealing with Warmzone. In addition to Warmzone’s industry leading products, Warmzone provides unparalleled customer services, which include professional system design, free installation training, and personal, expert installation support. Call a radiant heat professional today at 888.488.9276 to discuss your floor heating options. January’s record-breaking snowstorms proved to be a serious test for residential and commercial roofs in the Baltimore area during the winter of 2015-2016. Some homeowners struggled to manually remove snow from their roofs during the infamous blizzard of January 22-23. Snowfall from the multi-day storm ranged from a whopping 22 to 25 inches across Baltimore county. While most homes and commercial structures were more than capable of handling the heavy stress loads of the recent storms, the subsequent ice dams and potential for snow and ice to break free from roofs and fall on those below proved to be the most significant threats. 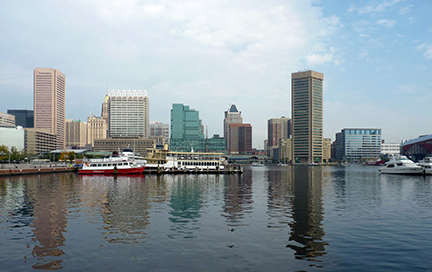 The view of Baltimore from the Inner Harbor waterfront. Baltimore businesses and building owners are tasked with keeping their roofs in safe condition to prevent snow and ice from falling and injuring pedestrians on the sidewalks below. And though homeowners are less worried about law suits as a result of ice falling from their roofs, they are faced with the potentially costly threat of water damage as a result of ice dams. As heat rises from the home, it can escape into the attic and warm the roof, causing water to trickle down near the roof’s edge. But since the roof eaves are colder, the water refreezes. As this process is repeated, water can build up behind the ice where it can seep into tiny cracks of the roof. Each night, as the water refreezes, it expands, paving the way for more water to seep into the cracks and eventually into the home. The resulting water damage within walls and ceilings can be expensive to repair. Warmzone roof deicing systems and self-regulating heat trace cable for gutter heating systems offer ideal roof heating solutions for preventing hazardous ice dams and heavy icicles from forming on roofs. The roof heating systems are easy to customize and install. 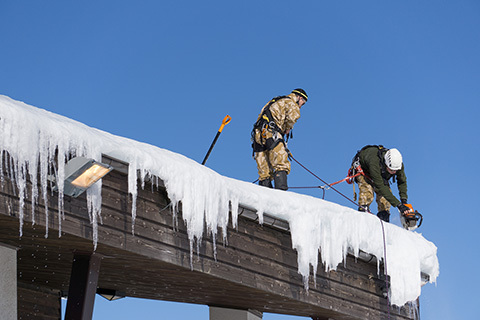 Once installed the roof deicing and gutter trace systems operate only when conditions warrant, keeping heavy ice from damaging roof gutters and preventing ice dams from forming along roof edges. In addition to Warmzone’s large variety of industry leading roof deicing systems, Warmzone radiant heat experts work closely with customers to determine the best and most affordable option for the roof. The most popular roof heating system features an advanced polymer heating element (RoofHeat STEP) that can be installed directly under roof shingles. This low-voltage system has proven to be a favorite roof heating solution among professional installers and homeowners throughout the Baltimore area. Heat trace cable can also be installed to heat gutters and downspouts, or the systems can be combined to produce optimum results. Many home and business owners in Baltimore are already enjoying the benefits of a Warmzone roof deicing system. To learn more about Warmzone’s roof heating options, or to speak with a radiant heat expert, with no obligation or sales pressure, call 888.488.9276. As an industry leader, Warmzone offers one of the most informative radiant heating websites available. Visit warmzone.com and learn more about radiant heating systems and why some systems (and services) are better than others when it comes to heating specific projects. Global consciousness is not only moving us towards social responsibility, but new, more efficient landscaping and snow melting removal solutions. Many have discovered the clean, energy-efficient operation and benefits of radiant heat snow melting solutions. But don’t just take our word for it. Check out these projects and comments from a few Warmzone customers. During the most recent snow event it was interesting to see that the (city) sidewalks were completely dry and free of snow while the plow trucks were still pushing the snow off the roads. The City of Oak Grove is very pleased with our heated sidewalks and would highly recommend Warmzone products. – Public Works Director, City of Oak Grove, Missouri. 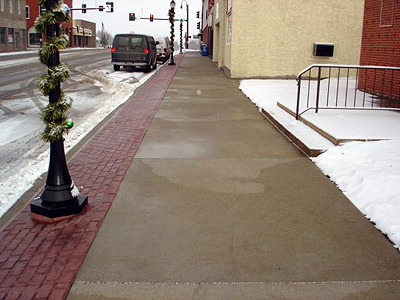 When a municipality in Missouri was installing heated sidewalks throughout their historic downtown area, they looked to Warmzone to do the job. The city’s Public Works Director, John, contacted Warmzone to discuss the project and provide the requirements of a heated sidewalk system that spanned the downtown area. Warmzone’s superior customer service is what distinguishes it from the competition. Unlike other radiant heat providers and distributors, Warmzone provides complete design, engineering and installation services. And unlike most other radiant heat distributors and manufacturers, Warmzone offers a wide selection of products and brands, so the experts cancan recommend the ideal solution for your needs – without bias. The expert consultants and design and engineering staff at Warmzone are second to none. Prior to any installation, Warmzone provides a detailed engineering drawing, so you’ll know all the electrical requirements, layout and performance expectations of the system prior to beginning the installation. Warmzone stays with you throughout the installation process. If needed, a master electrician is on hand to guide your installer through the process and answer any questions. This emphasis on “after-sale” customer service is just one reason why professional builders prefer working with Warmzone, and why homeowners recommend Warmzone to their friends. Their unparalleled expertise and customer service have earned Warmzone the reputation as the trusted radiant heat leader. While Warmzone offers many different radiant snow melting systems, it’s also nice to know that Warmzone snow melting systems are easy to customize, so you can be assured your system will meet your specific needs. From small residential projects to large commercial initiatives, Warmzone has a wide selection of proven products and will recommend the ideal solution while keeping within your budget. As John discovered, Warmzone has a highly knowledgeable, experienced professional staff that cares about their customers. It’s no wonder that as a trusted leader of radiant heat solutions, Warmzone has radiant heat snow removal systems installed in residential and commercial properties throughout Northern America. When I’m outside, a lot of folks in my neighborhood stop and have conversations or ask questions about the heated driveway. I know that some think this would be extremely expensive to operate, but last month, even with all my Christmas lights on every night, I saw only a $150 increase in my electrical bill. When you consider the benefits of electric radiant heat under driveways, walkways and other common areas, whether you’re a business owner or a homeowner, it simply makes good “dollars and cents” to install a radiant heat snow melting solution. For just pennies on the dollar, you can anticipate and expect your driveways and sidewalks to be clear as the snow falls. How many of your neighbors can say that? And a clear driveway or walkway not only clears the path for foot traffic, it also minimizes possible consequences of improper or inadequate snow removal. One slip and fall not only compromises the safety and security of loved ones, employees and even customers. 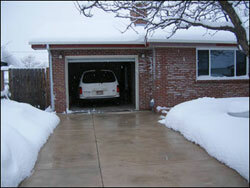 A heated driveway and/or sidewalk dramatically increases your liability as a home or business owner. As they say, time is money, whether you’re on your way to work or waiting for your customers to arrive, so why wait for your snow removal service? You don’t have to play the same old game of beat the clock any longer–Warmzone electric radiant snow melting systems are designed to sense changes in moisture and temperature, changes that indicate impending snow. The system is alerted and the heating cable is activated before snow hits pavement, so your walkways, steps, sidewalks and driveways are safely cleared before your boots ever see the pavement. 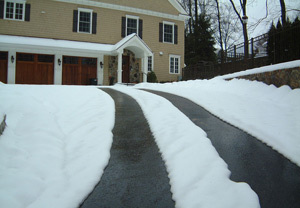 Considering the initial installation cost and overall operational costs (literally pennies on the dollar) of your electric radiant heated snow melting system over time, you’ll benefit far more in the long run from snow melting system that is faster, more dependable and even less damaging than the local crew you’ve been hiring and waiting on to clear your driveway or parking lot. What makes Warmzone radiant snow melting solutions so popular? Flexibility, for one. Warmzone’s ClearZone radiant heating cable is the strongest, most durable, effective heat cable on the market and can be purchased in pre-configured mats, or on the spool for more customized applications. It’s also safe and effective to use under just about any type of surface, including asphalt, concrete, tile, brick and more. 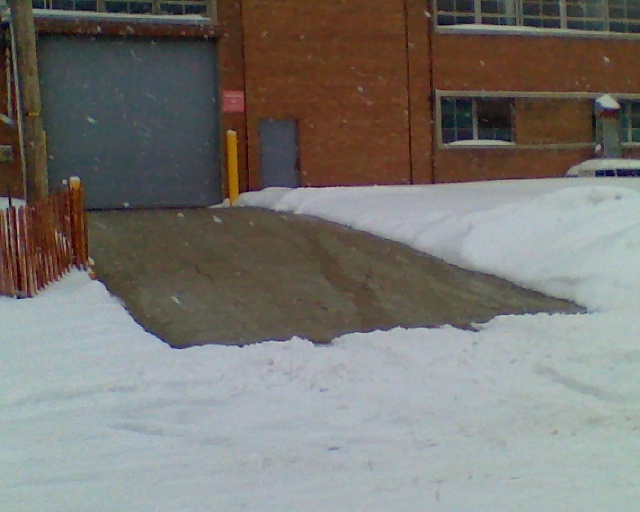 Which is why you’ll find Warmzone snow melting solutions under a variety of surfaces including: city sidewalks, walkways and parking areas; outdoor steps and stairways; loading docks and platforms; even ramps and bridges. Typically our competitors are a lot less flexible, offering “one-size-fits-all” snow melting systems, from products, to pricing to installation. Choosing Warmzone means you benefit from the largest selection of radiant heating systems. Warmzone is not limited by one manufacturer, system or solution. With a huge selection of products to choose from, plus the experts and the expertise to complete a project, we can design and execute the installation of the optimal radiant snow melting system for your situation. Warmzone’s professional designers will thoroughly evaluate your radiant heating system before you install it to create the optimal solution for you. You’ll know the electrical requirements, technical specifications and system performance expectations before one foot of heat cable is installed. Our valuable service minimizes any “installation surprises” that you may otherwise encounter, which ultimately saves you time and money in the long run. So if you’re shopping around and evaluating your radiant heat options, make sure you compare product price, quality, experience and customer services. You’ll discover why Warmzone is the trusted radiant heat leader. While it’s true that Warmzone radiant heated snow melting systems stand to save you a few bucks over traditional snow removal services, the real value comes with the benefits of having a fully-automated heated driveway that is dry and clear before you ever leave the house. If you can conceive it, Warmzone can achieve it. Warmzone has the experts, and the expertise, to guide you through or execute almost any installation—regardless of the scope—while satisfying your requirements as well as your budget. We offer a comprehensive menu of residential and commercial radiant snow melting solutions, along with the engineering and design services to do the job, and do it well, from large commercial projects to small, custom jobs. Why not call us at 888-488-9276 for your next radiant heated snow melting project for a free consultation and the best solution to your snow removal needs. Residents in New York City enjoy a number of perks and conveniences of life in the big city, but the splendor of living among the towering buildings and concrete canyons also comes with its share of challenges. New Yorkers are survivors, and every day during their brisk walks along the streets they’re constantly on guard as they maneuver through a sea of other hurried pedestrians, bicycles, taxis, delivery trucks and so on. The fast pace is all part of life in the Big Apple. As if these daily obstacles and dangers weren’t enough, there are other hidden dangers that descend upon the city during the snow-filled winter months. As New Yorkers navigate the icy sidewalks and slush-filled streets, a more significant safety threat looms high above, well out of sight and out of mind of most pedestrians. Professional roof snow and ice removal team cutting through ice to remove the heavy and dangerous load from the roof. After heavy snow storms, when temperatures climb back up above freezing, roofs begin to warm and slabs of snow and ice can break away and tumble onto unsuspecting pedestrians below. While most building owners take precautions to avoid this from happening, every year in the Big Apple there are reports of pedestrians being struck by snow or ice that has fallen from roofs or other structures. Streets had to be closed around New York’s new 1 World Trade Center recently when sheets of ice broke free from the 1,776-foot structure and slammed into the ground at 100-mph. So, the responsibilities of building owners are clear. State law imposes a specific duty upon New York City building owners to ensure that pedestrians are not injured from snow or ice accumulations that fall from their buildings; whereas they must take reasonable steps to prevent ice from falling to the street. These steps typically range from snow guards to automated roof deicing systems. In addition to commercial buildings installing snow guards or roof heating systems, it’s also beneficial for New York homeowners to protect their roofs and gutters with a radiant roof heating system. While they don’t face the same level of potential liability as building owners in crowded cities, installing a gutter trace system and/or a roof heating system in valleys and along roof edges can ultimately save money in the long run. These affordable roof deicing systems can be customized to meet homeowners’ specific snow melting needs as well as their budget. Heat trace cable can be installed in “trouble spots” on the roof or just in gutters and along the roof’s edge to eliminate ice dams – the principle culprit responsible for costly roof and water damage. Warmzone roof deicing and gutter trace systems offer one of the best roof heating solutions available for preventing hazardous ice dams and icicles from forming on roofs. In addition to Warmzone’s large variety of industry leading roof deicing systems, Warmzone radiant heat experts work closely with customers to determine the best and most affordable option for the roof. The most popular roof heating system features an advanced polymer heating element (RoofHeat STEP) that can be installed directly under roof shingles. This low-voltage system has proven to be a favorite roof heating solution among professional installers and homeowners in New York. Heat trace cable can also be installed to heat gutters and downspouts, or the systems can be combined to produce optimum results. To learn more about Warmzone’s roof heating options, call 888.488.9276. Many home and business owners in New York are already enjoying the benefits of a Warmzone roof deicing system. Call a Warmzone consultant to learn more – with no obligation or sales pressure. As an industry leader, Warmzone offers one of the most informative radiant heating websites available, so visit warmzone.com and learn more about radiant heating systems and why some systems (and services) are better than others when it comes to heating specific projects. 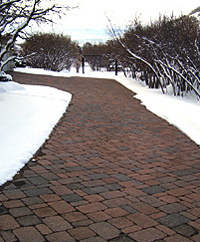 Radiant heat snow melting systems can be designed, engineered and installed in any size, shape and type of driveway. 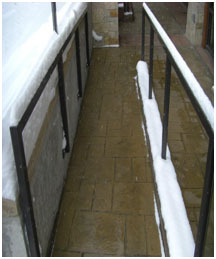 From large parking lots to small driveways, steps or sidewalks, radiant snow melting systems can accommodate virtually all your snow melting needs. But the custom options don’t just stop there. You have a variety of options to choose from to fit your budget. You can heat your entire driveway area or just a strip down the middle, or perhaps just two 2-foot wide tire tracks. When you work with a trusted leader like Warmzone, your system will be designed and engineered so that it is the best customized radiant heat solution for your needs. The ClearZone radiant heat system is one of the most proven snow melting systems on the market, which is why it’s not only a favorite among homeowners, but construction professionals as well. The heat cable can be installed in a variety of applications, including concrete, asphalt, and under pavers. For years the ClearZone snow melting system has proven itself to be one of the most versatile and reliable radiant snow melting systems on the market. It is installed in numerous mediums, but concrete is the most common application for ClearZone heated driveways. The rugged heat cable is designed to withstand the stress of heavy concrete pours. During the installation, the ClearZone cable is laid out and then zip tied to the wire remesh. The concrete is then poured over the cable. Hot asphalt can damage some lower quality heat cables, but ClearZone cable is designed to withstand both the extreme temperatures and stress (from the compression) of newly poured asphalt. The radiant heating cable is laid out on the base surface (usually compacted sand), and the asphalt is then hand shoveled on top of the cable and then compacted. For asphalt applications, it is recommended (but not required) to install 1-inch rigid insulation underneath the base surface. The insulation can be installed underneath the base surface or it can be laid on top of the base surface and the snow melting cable can then be secured on top of the insulation. 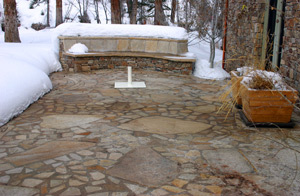 ClearZone radiant snow melting systems are the most effective systems for heating under pavers. Installing a radiant snow melting system under brick pavers is also one of the easiest radiant heat installation methods. The heating cable is laid out on the base surface and the pavers are installed as normal, directly over the cables. Because the ClearZone cable has been tested and approved for wet conditions, the cable can come in contact with moisture without its performance being affected. Continued – Go to Installing a Radiant Snow Melting System (Part II). Continued from Installing a Radiant Snow Melting System (Part I). The ClearZone snow melting system is unique because it isn’t limited to new construction applications and can withstand the rigors of concrete pours and hot asphalt. If you have an existing asphalt driveway and intend to re-pave it, you can retrofit your driveway with a ClearZone snow melting system. The heat cable is secured to the existing asphalt with clips and nails and only needs to be embedded under just ½-inch of asphalt. The new asphalt is hand shoveled onto the cable and then compacted. ClearZone cable is simple to install and provides the best performance for heating asphalt driveways. The heat cable is wired to the master controller, which is usually mounted on a wall in the garage. An aerial or pavement mounted snow sensor is wired to the controller. When the sensor detects precipitation and the temperature is below a set point (usually 39°F. ), it signals the controller, which then sends power to the heat cable to warm the driveway. While the system is fully automated, the controller also features manual override capability for times when you may need to melt a snow drift or ice that formed in a shady spot. In addition to the many different types of surfaces that the ClearZone snow melting system can be installed under, you have many custom configurations that you can choose from. Warmzone will work closely with you to keep within your budget while providing the optimum snow melting system for your needs. As a leading provider of radiant heat solutions, Warmzone will provide a detailed design of your snow melting system so that you know all the electrical and layout requirements prior to any installation. Warmzone also provides you with technical support during the installation. Once installed, radiant snowmelt systems are virtually maintenance free, and in addition to helping preserve the quality of your concrete/asphalt driveway or sidewalks, it also eliminates the damage caused to surrounding grass and vegetation from salt and corrosive snow melting chemicals. With your radiant heat snow melting system, there’s no need to apply salt or harsh snow melting chemicals to your driveway. So enjoy those snowy mornings from the warmth of your living room and admire your clear driveway as you sip your hot coffee. The days of shoveling and salting are over. When it comes to installing a snow melting system, it pays to work with the best. In addition to Warmzone’s competitive pricing, you’ll receive top-notch customer service. Call and talk to a radiant heat expert today (888.488.9276) to learn more about heated driveways and snow melting systems. You can also send Warmzone your project information and receive a free radiant heat quote. There’s no obligation. Go back to Installing a Radiant Snow Melting System (Part I). Does a Heated Driveway Work Through the Night? Driveway heating is designed to make your life easier. Many people wonder how much work a heated driveway requires once it is installed. Having to babysit the system would be considered a huge deterrent to purchasing a heated driveway, thus great effort has gone into streamlining the systems so they are fully automated and maintenance free. The automatic snow sensor that comes with every heated driveway is designed to set-up initially and then only touch it when small adjustments are needed throughout the season. The snow sensor does all the work of detecting snow and when to turn the heated driveway system on and off. Going on vacation or even going to bed at night are usually the best times for snow to have time to accumulate. Winter storms don’t usually come at the most convenient times so planning around them is tough to do. 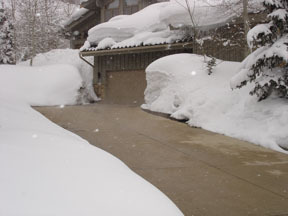 With an automated snow melting system you really can leave it alone and let the heated driveway do all the heavy lifting. The driveway heating cables work when needed to keep the surface of your drive warm enough that snow and ice can’t stick for very long. You can enjoy a long, peaceful night of sleep as well as the knowledge that your driveway will be clear in the morning, no matter how deep the neighbor’s is.